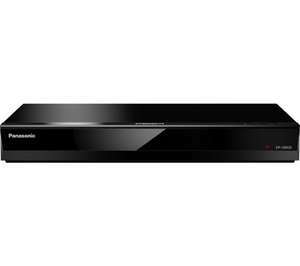 I'm currently looking for a Blu-ray player after mine has given up and found this, It's the best price I could find, and for the money I don't think you can get better, however I think I'm going to pay about £100 more for the Sony UBP-X800. From DC's latest superhero blockbuster to Attenborough's inspiring documentaries, it all looks great on the Panasonic UB420 Smart 4K Ultra HD Blu-ray & DVD Player. Ultra HD Premium Certified, you can marvel at the smallest of details thanks to a resolution that's up to four times better than HD. Hook up the UB420 to a compatible 4K HDR TV and you can enjoy the latest HDR standards, HDR10+ and Hybrid Log Gamma (HLG) (available from Summer 2018). You'll see a greater range of colours, with more detail in bright and dark scenes. At the heart of the DP-UB420 is a HCX Processor, developed and refined by Hollywood specialists. Thanks to this insider expertise, colours are more realistic, so you can watch films just as the director intended. Saving your latest UHD Blu-ray for the weekend? Discover more entertainment with 4K HDR Netflix and Prime Video and start binging on some boxsets. There's also BBC iPlayer for catching up on shows, and YouTube for sharing the latest viral sensation (all apps available from Summer 2018). Sandstrom Gold Series cables are just the ticket - they even come with a reassuring lifetime guarantee. Happy faces all round. It's been this price for a while, I bought one 3 weeks ago. Warning ... the firmware update is precarious! Mine downloaded the update, do not turn off etc - expected it to reboot but it did nothing. No light, no sound. Left it 10 mins and thought OK, lets turn on. Red light blinking rapidly for 20 mins with nothing on the screen but it eventually came back. In all my years of motherboard/GPU firmware updates I've never been so tense! It's been this price for a while, I bought one 3 weeks ago.Warning ... the …It's been this price for a while, I bought one 3 weeks ago.Warning ... the firmware update is precarious! Mine downloaded the update, do not turn off etc - expected it to reboot but it did nothing. No light, no sound. Left it 10 mins and thought OK, lets turn on. Red light blinking rapidly for 20 mins with nothing on the screen but it eventually came back. In all my years of motherboard/GPU firmware updates I've never been so tense! If the official firmware update knackers it in the first year, just take it back, no need to worry about it. "Intriguingly, despite its low price tag, the deck offers support for both regular HDR10 and HDR10+, the new dynamic metadata standard created by 20th Century Fox, Panasonic and Samsung, as a rival to Dolby Vision." At this price though, I think it's the best you can buy, but as I've mentioned, I'll probably stump up an extra £100 for the Sony. Ah, got my hopes up for a minute! Seeing this post here I assumed Currys online had stock for dispatch. Ah, got my hopes up for a minute! Seeing this post here I assumed Currys …Ah, got my hopes up for a minute! Seeing this post here I assumed Currys online had stock for dispatch. Sorry, I didn't check stock, now I have there's none near me in Loughborough. From the few checks I've done (Leics, Notts, Derby) there's also none, but they do have stock in Grantham. only downside. MKV has all HD audio streams intentionally disabled. own this,only downside. MKV has all HD audio streams intentionally …own this,only downside. MKV has all HD audio streams intentionally disabled. Yeah I think this is an issue with a few players, weirdly on my Sony Smart bluray player (which has just given up) it had no sound for MKV, but on my older Sony (non smart) TV it does.